Home » Uncategorized » When impact investing is powered by cryptocurrency! When impact investing is powered by cryptocurrency! Impak Coin fully legal crowdsale offers investors to make a positive change in the world whilst providing return. Have you heard about the cryptocurrency boom? – Bitcoin, ethereum, monero, etc. ? Have you heard about impact investing? If your answer is no to one or two of these questions you should look closely at impak Coin to kill two birds with one stone! On April 5th 2017, The Ford foundation announced a $1 billion commitment to the growing investment field known as impact investing. The move sends a signal to other investors, foundation and institutional investors that perhaps the time has come to consider the potential of impact investing. Impact investing is all about seeking to earn not only attractive financial returns but concrete social returns as well. And in fact, this sector is booming and number of investors and funds are seeing both significant investment opportunity and significant alignment with their mission to reduce poverty, injustice in respect of the environment. The World Economic Forum estimates the impact investment sector to reach in the trillions of dollars by 2020, so it’s a big and growing market and is genuine option for people wanting to put their money where it matters. Blockchain-based cryptocurrencies recently passed $100 billion market cap, and the technology is being adopted in projects all over the world. The fact that multibillion dollar companies like Toyota and Deloitte are working with the blockchain just adds to the technology’s reputation and proves it has value. As for ICOs, around 20 offerings a month are currently taking place and the Tezos blockchain ICO is the most recent record that generated US$232 million, ending on July 13.
impak Finance, the Canadian FinTech company focused on driving the social impact economy, announced this month the public crowdsale of impak Coin, which is one of the first fully regulatory compliant cryptocurrency to launch it’s ICO. By writing that new page in the history of ICOs, impak Coin removes the risk associated with the purchase of unregulated digital currency. 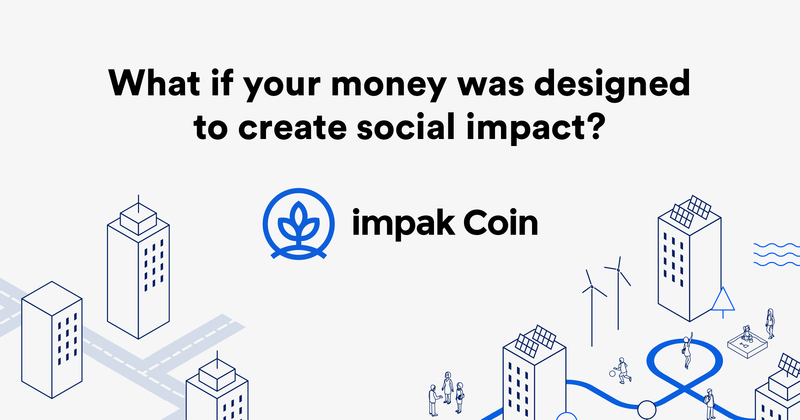 The goal of impak Coin is to accelerate the interaction between citizens, investors and entrepreneurs in this new virtual space dedicated to the social impact economy, called impak.eco. The impak Coin combines the advantages and functionalities of complementary currencies, recognition programs, and new cryptocurrencies. said Paul Allard, Co-founder and CEO of impak Finance.